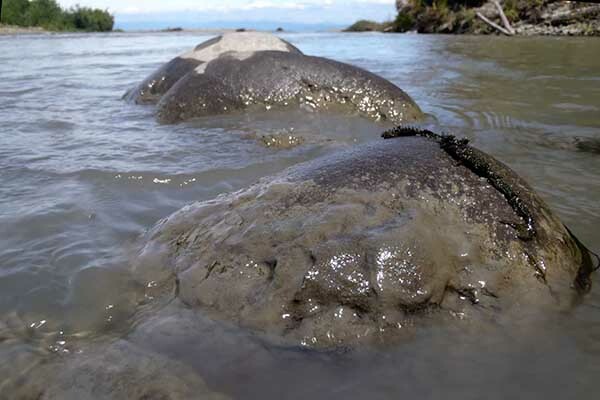 Photograph of sediment-covered rocks in the lower Elwha River just upstream of the river mouth at the Strait of Juan de Fuca (June 20, 2012, Chris Magirl). In 2011, the National Park Service commenced the incremental removal of two century-old dams along the Elwha River, Washington, in order to restore ecological and sediment-delivery processes (U.S. Department of the Interior, 1996; Duda and others, 2008, 2011; Curran and others, 2009). Elwha Dam (32-m high; 8 km from the Strait of Juan de Fuca) was completed in 1913, and Glines Canyon Dam (64-m high; 22 km from the Strait of Juan de Fuca) was completed in 1927 (fig. 1). Elwha Dam formed Lake Aldwell and Glines Canyon Dam formed Lake Mills. During the decommissioning period, each dam was notched from the top down in progressive steps to allow a metered release of sediment to downstream river reaches (Randle and others, 1996; Randle and Bountry, 2010; Czuba and others, 2011). Throughout the project, decommissioning was periodically ceased (termed “deconstruction hold periods”) to reduce effects of increased sediment concentration on migrating fish or to accomplish sediment-transport management targets (U.S. Department of the Interior, 1996; Czuba and others, 2011). Dam decommissioning started in September 2011 with both dams. Elwha Dam was completely removed by April 2012, which permitted unregulated release of sediment trapped in Lake Aldwell. Lake Mills Reservoir ceased to exist in autumn 2012 as the prograding delta of sediment in the reservoir finally abutted the lowered Glines Canyon Dam structure. In cooperation with the U.S. Environmental Protection Agency and the National Park Service, the U.S. Geological Survey (USGS) was asked to measure turbidity and calculate suspended-sediment concentrations in the lower Elwha River during the dam-decommissioning and river-restoration project. During the project, USGS operated a turbidity sensor at a water-quality monitoring station in the lower Elwha River (fig. 1), which collected data at 15-min increments. The USGS also collected suspended-sediment samples from the lower Elwha River about 380 m downstream of the monitoring station. A relation between turbidity and suspended-sediment concentrations, consistent with established USGS protocols (Rasmussen and others, 2009), was established to enable reporting of suspended-sediment concentrations in the lower Elwha River. This document contains calculations of total suspended-sediment concentrations and concentrations of suspended-sediment fines (particle sizes less than 0.0625 mm) in the lower Elwha River downstream of the dam decommissioning project from September 2011 to September 2013. A time-series record of suspended-sediment concentrations is reported using continuous turbidity data as a surrogate for suspended-sediment concentrations.